It’s ironic, isn’t it, that the time of year when the earth is giving more than we can possibly enjoy, I can barely find it in my strength to cook. While the charming, straight rows of the market garden bring all manner of produce to the kitchen countertop, it’s often around 4:30 pm that I hit the rocking chair with a cold beer and deeper desire to nap than cook. Despite the produce and goodness at hand – I find myself tired from the heat of the summer sun. But, die to ourselves we must, and regardless of the desire to sit rather than work, there are still mouths to feed. The littles have been spending their summer days playing in the new pond, swinging, working through their Explode the Code workbooks, climbing the haystack, and swimming at Auntie’s house. By the end of the unbearably hot and sweaty days, they’re hungry. So, instead of throwing a temper tantrum that I’m somehow now the Mom that’s responsible for cooking (how am I at this stage of life already? ), I chose to get inspired by the mountain of fresh herbs stacked up on the kitchen countertop. Plus – I was ready to carbo-load. If you’ve ever worked the gardens in July heat, you know how delicious chilled wine and carbs taste at the end of the day. Just give in. 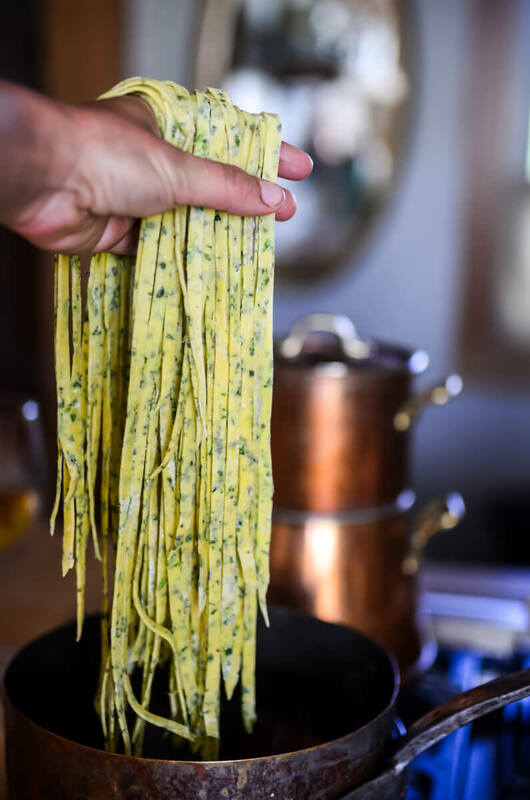 Homemade herb pasta may sound scary, but it’s not. In fact, if you haven’t ordered a pasta roller, may I encourage you to do so? They’re inexpensive and quite fun. The taste of homemade pasta is 250% better than store-bought pasta. Scratch that. 350% better. Maybe even more. If you’re feeling uninspired in the kitchen, instead of opting for take-out, opt to feel inspired by trying something new. 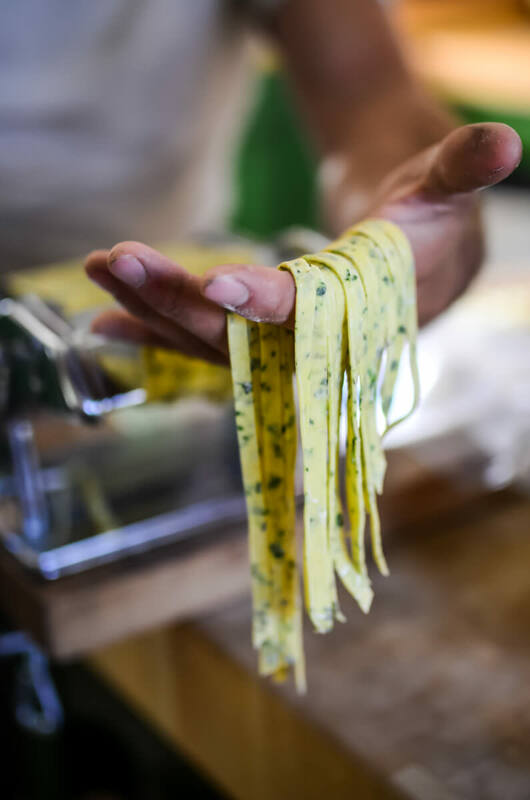 And let homemade herb pasta be on top of that list. 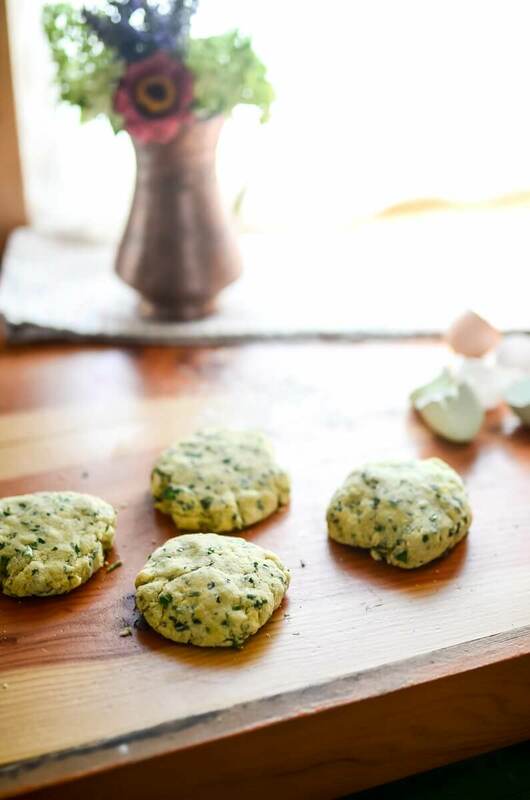 In a food processor, or bowl, combine the flour and minced herbs. Pulse to combine, or if you’re using a bowl, use your hands. Add in the eggs, one at a time, followed by the egg yolks. Once they’re all added, the dough will have a slightly sandy texture but should come together if you squeeze it. If it doesn’t, you can add a tablespoon of water at a time until it does. Shape the dough into four balls and then flatten them out with the palm of your hand to create a disk. Wrap the dough discs in a wet tea towel and set them in the refrigerator for about 30 minutes – longer is fine if needed. Sometimes I prepare the dough after lunch so it’s ready for supper. Sometimes I forget and just make it right before dinner and don’t rest it at all, though it’s better for the rest (as we all are). 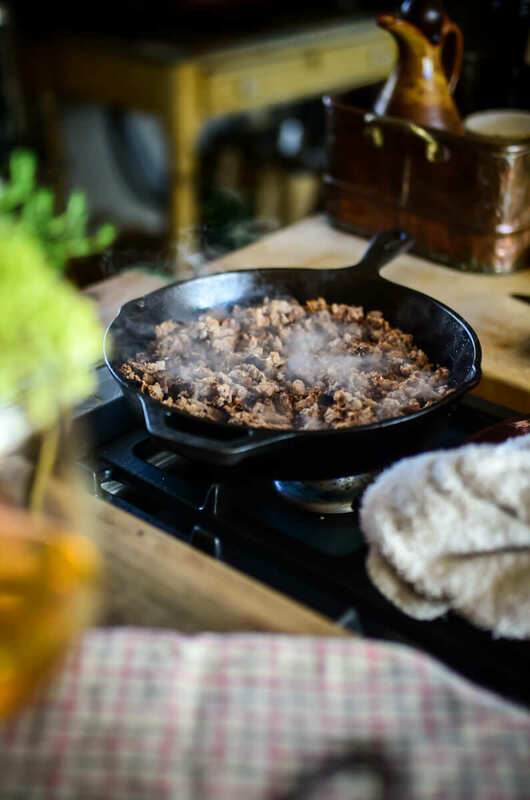 When you’re ready to prepare supper, add the ground pork to a cast iron skillet and brown it over medium heat. I like to brown it to the point that it gets a wee bit crusty. Once it’s browned, add in the salt and the garlic, stir to combine. Set it aside while we prepare the pasta. While the meat is browning, heat up a saucepan with heavily salted water to cook the pasta in. 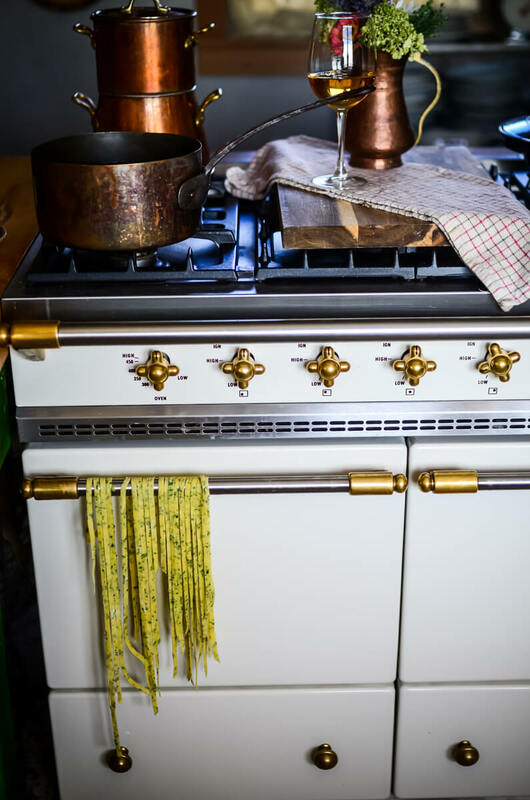 Homemade pasta is super cool in the fact that it cooks in only 2-4 minutes! But before we can cook it, we need to roll it out and cut it! 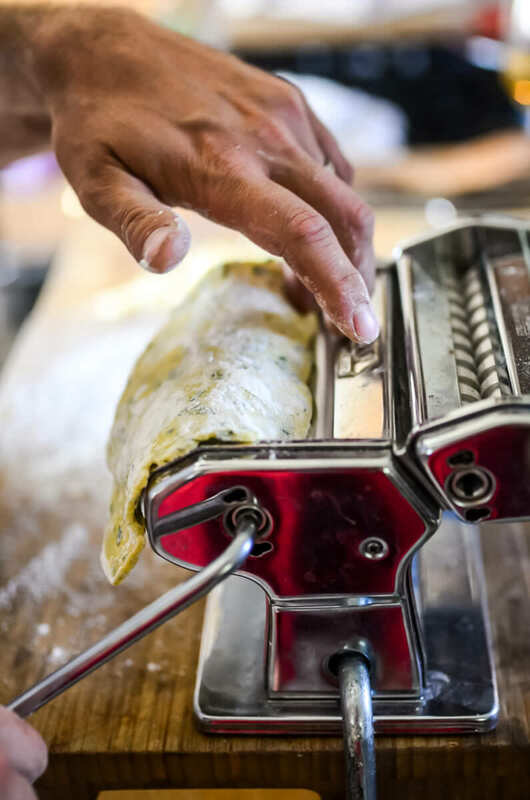 Using the pasta roller set on the widest setting (usually marked as “0”), take one of the dough discs from the refrigerator and dust it lightly with flour. Put it into the crack of the pasta machine and turn the handle to feed the dough through. Once it’s through, fold the edges into the center, and send it through again to get a nice, clean, straight pasta sheet. Send the pasta sheet through the pasta roller at the next tightest setting (usually marked as “1”), twice. Then repeat with the next tightest setting (usually marked as “2”). If at any point the pasta sheet becomes sticky, dust it lightly with flour. Continue, running the pasta sheet through twice on each setting, until it’s the thickness of a debit card (usually around setting “5”). 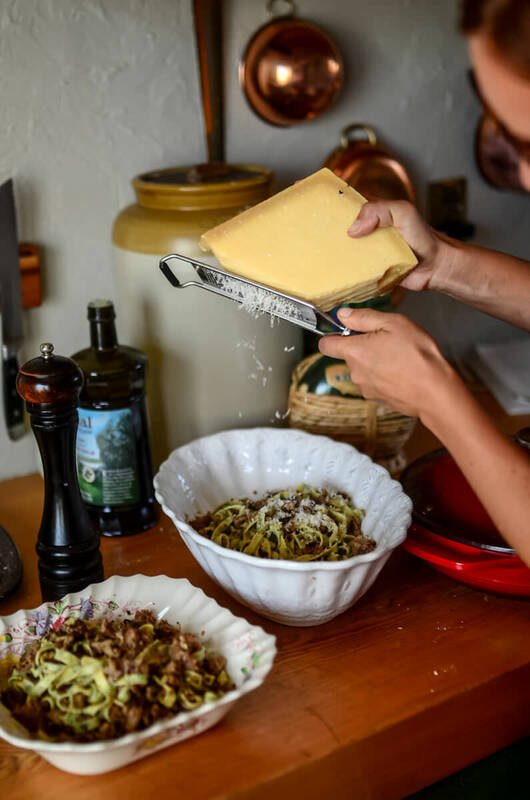 Lastly, run the pasta through the pasta cutter of your choice – I prefer the fettuccini size noodle. You can also cut the noodles by hand, with a sharp knife, to the shape or size of your choosing. Hang the noodles until you’re ready to add them to the boiling water. A light dusting of flour will prevent the noodles from sticking together. When you’re ready to prepare the noodles, cook them in the boiling water for 2-4 minutes until cooked “al dente”. 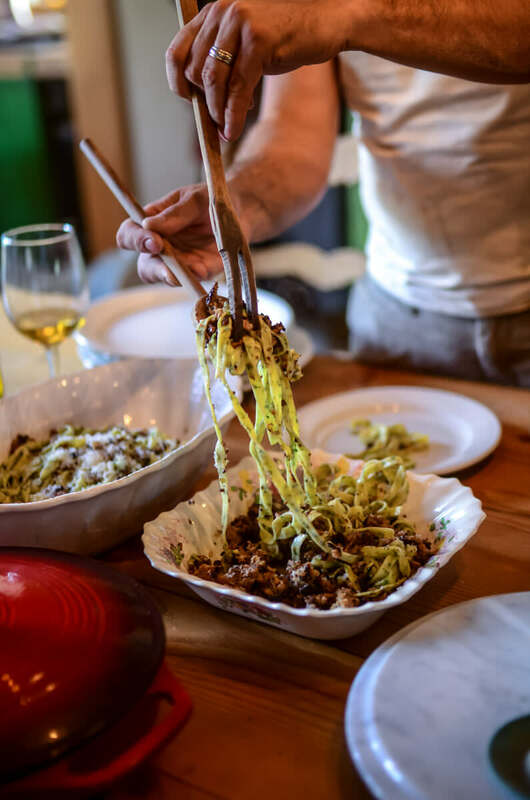 Scoop the cooked noodles into a large bowl, drizzle them generously with a good olive oil, and add the cooked pork into the bowl. 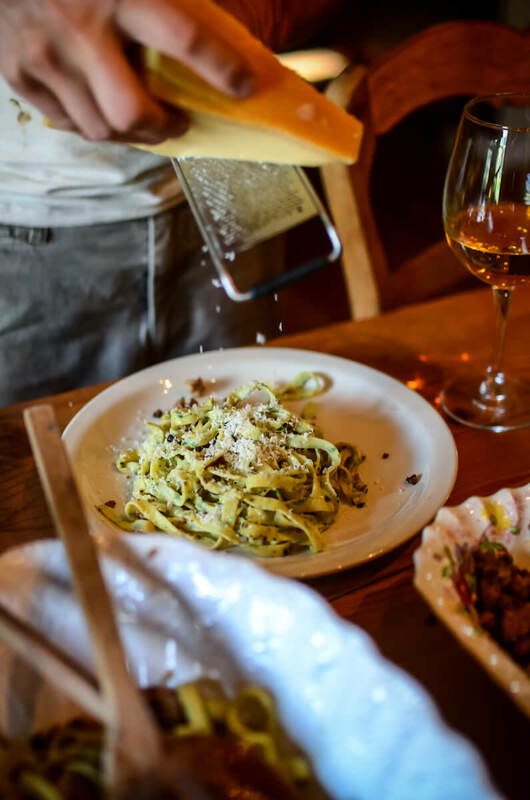 A generous sprinkling of Parmesan cheese certainly doesn’t hurt matters. 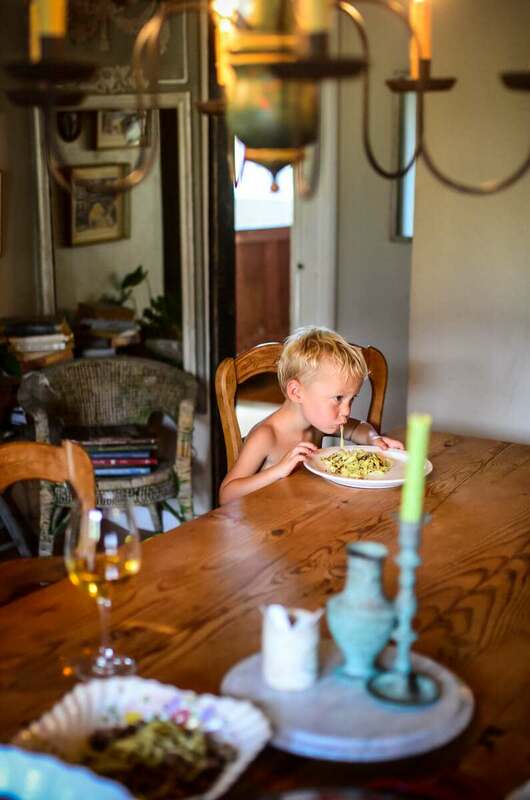 Because it was even too hot to enjoy the homemade herb pasta al fresco, we instead opted for the confines of the air-conditioned dining room, where the wine would remain chilled if only for a few minutes longer. I know, I know. We’re supposed to soak up this delicious summer sun as much as possible. Turns out though, summer brings with it a few extras on the farm: like flies. I’ll stick with the homemade herb pasta instead, please. No flies invited. « Essential Oils For Skincare. Yum! I will have to try this for sure! Made this tonight but used ground beef since I didn’t have pork. After my daughter closely inspected for pieces of onion, she tasted and declared the meal a winner. ???? Thank you for sharing this recipe. Looks amazing! I have started using all purpose Einkorn flour for my homemade pasta and my whole family agrees it tastes better that way! Thanks for introducing me to Einkorn. Try it next time you make pasta! This looks so incredibly good. That said, I have noticed you’re using a lot of all purpose einkorn flour in recipes recently, rather than some kind of whole grain/soaked/sprouted type thing. What gives? Not trying to be critical at all, I would just love to see a post on your current thoughts about all that. You are my food hero! This recipe sounds lovely! Can you suggest an herb combination for me? I’m completely clueless and need someone to lay it all out for me!